Silverhowe Bed & Breakfast is in an ideal location with only a ten minutes walk to Pitlochry town centre. There you will find numerous restaurants, pubs, coffee shops and a range of local shops. At Silverhowe we offer 4 bedrooms, all ensuite and at ground level with ample private parking. The guest lounge and breakfast room both provide beautiful views of the garden and surrounding mountains. A courtesy service can be provided to and from the station and to the theatre by arrangement. Pitlochry is at the heart of Scotland with the main cities all within less than two hours drive. Why not base yourself in this beautiful Victorian town surrounded by some of the most spectacular scenery. There is plenty to see in the area around Pitlochry from castles, distilleries, mountains, lochs, rivers to the wildlife. The Festival Theatre and the salmon ladder are another two of the major attractions. There are many events throughout the year and information on these can be obtained on the VisitScotland or Perthshire Tourist Board web sites. 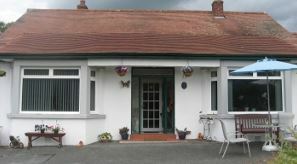 A warm welcome awaits you at Silverhowe Bed & Breakfast.